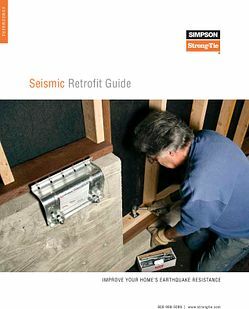 Simpson Strong-Tie's Seismic Retrofit Guide (F-SEISRETRGD12R) helps educate homeowners about how earthquakes affect a home and the steps to take to reinforce the structural frame of a house. With this guide and the right tools, do-it-yourselfers can increase the structural integrity of their house, making it stronger and safer. For those not inclined to tackle this type of project, the guide can help you make sure your retrofit is done right.